The Ballymurphy massacre has the simplest of all dramatic structures. It is a narrative built around a chronology – a three-day assault by the British Army on a Belfast housing estate following the introduction of internment that left ten unarmed civilians dead and many others badly injured. This story is told through a mixture of stock footage, interviews, re-enactment of events and documentary evidence. For all its simplicity the tale the film has to tell is utterly convincing and devastating in its impact. There are many shocking details. It was well known that loyalist paramilitaries had been involved in attacks and in fact one group, the Ulster Volunteer Force, recently claimed to have fired into the area. What becomes clear from the details in the film is that even this early in the conflict the loyalists were operating in coordination with the paratroops, drawing out local people by attacking their homes in order that military snipers operating from behind and above the loyalist gangs could mow down the locals. It is also clear from the account that the soldiers could have no doubt that they were shooting at unarmed civilians, that they shot anyone who tried to rescue the injured, and as a number of the victims were not fatally injured but bled to death as they lay for hours under a hail of fire. In one case there is a witness and forensic evidence of an injured civilian having the coup de grace delivered by having a pistol fired twice into the back of his head at short range. Yet Ballymurphy is the hidden massacre, forgotten while the same groups of soldiers, using the same methods at the civil rights march in Derry, provoked mass protests across the world. 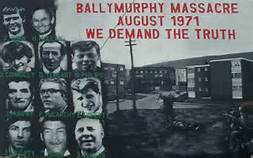 What we find is that there was more to Ballymurphy than simply the killing fields. Michael Jackson, later to become head of the British Army, was operating as press officer in the area and disseminated a story of a ferocious gun battle between the provisional IRA and the paratroopers. The local Unionist press took up the story. The tale was followed by a perfunctory inquests that simply recorded the cause of death of the victims. These were accompanied by statements by the soldiers of coming under a barrage of fire and firing in self-defence. One soldier spoke of a middle-aged grandmother moving about a field and attacking him with a machine gun. In fact there was no evidence of a gun battle. No weapons, no rounds, not even empty shell cases were recovered from this battle. The army may well have expected that the IRA would return fire but details of internment raids were well known and the IRA had dispersed to safe houses. What we find is that the same soldiers using the same methods, and with the same stories of imaginary gun battles, only months later were to carry out the slaughter at the Derry civil rights march, this time with a large amount of British whitewash absolving the troops in the form of the Widgery Report. How did this happen? To a certain extent the issue is left open. Former soldiers report how welcoming Catholic residents were demonised and defined as the enemy and of the role of the paratroops in terrorising areas. There is some discussion of the involvement of Brigadier Frank Kitson and his use of the paratroopers and Greenjackets as an instrument of pacification. There is also reporting of rivalry inside the British Army, with the Belfast regiments declaring a policy of no barricades and no no-go areas and looking down on the Derry troops who were unable to enter the Bogside. Kitson is famous for his book Low Intensity Operations but it is important to realise that this simply translates into methods for suppressing largely unarmed civilians and that he was one of a number of officers who had used methods of mass repression in Kenya and Aden. The British government had consciously decided that they were facing a mass upsurge and to preserve partition and the Stormont government they would have to use the methods that they had used previously other colonial situations. The problem with this conclusion is that the only possible political resolution to the massacres of Ballymurphy and Derry is the expulsion of Britain from Ireland. These have been a constant feature of the British presence in Ireland and they will be so in the future if further resistance arises. The film gives us unwavering admiration for the relatives of the dead who have struggled over decades to find justice. However we have become used to relatives leading these campaigns. Where are the political parties? The initial group to gain world attention was the mothers of the plaza de Mayo, an Argentinian group protested their disappeared children because all political groups and political activity were repressed by the Argentinian generals. The prominent place of relatives of today is because Sinn Fein is shy. They accepted the Saville Report, which ruled out any government policy of repression in favour of indiscipline by soldiers A to F. The fact is that Sinn Fein now support a political settlement based on the idea that the British are humanitarians interested in supporting democracy and eventually promoting a United Ireland. In those circumstances they have no problem in lining up to shake the hand of Prince Charles, Colonel in chief of the Paratroop Regiment. The narrative of the Ballymurphy massacre proves this is rubbish and that we are living in a dreamland. As a result of the decades of ferocious violence deployed by the British we are living in a dreary corrupt and sectarian failed state and the threat of violence will remain as long as the British do. The article sympathetically reviews “Ballymurphy Preciident” the documentary on the horrific massacre at Ballymurphy by the British army paras, who went on to massacre people in Derry on Bloody Sunday. It’s good except for the comments about Sinn Fein, who have worked with the families, not because they’re “shy” but because it’s right to put the families at the front, supporting them as much as possible, using their position in the Dail and communities affected, as the 2 clips show.